I’ve been thinking about making filled squash for a while now, early winter is a good time to do this as there is usually quite a variety on offer this time of year. They are not only packed full of vitamins, but also delicious and filling. A whole squash filled with something exciting is quite a fun food to serve – it works really well when you’ve got friends over for dinner. I made this with one medium sized squash, because that’s what the shops had to offer this week, but you can get smaller ones to use as individual serving dishes. Pre-heat your oven to 170OC. Slice the top off the squash, and put this to one side. Dig out the seeds and stringy pulp and discard these. Pour ½ a tablespoon of olive oil into the squash, sprinkle the herbal salt in, and add 2 whole cloves of garlic. These will infuse the flesh of the squash with their lovely flavours. 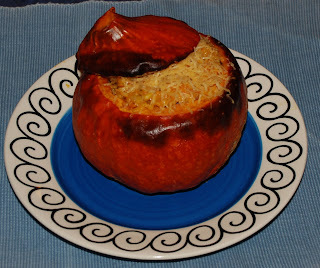 Place the squash and its top in the middle of the oven, and bake for 30 minutes. If you are using two smaller squash they will need shorter cooking time. Tear the porcini into small pieces, place in a mug, and add boiling water. Let this rest while you start making the risotto, to soften the mushroom and bring out the flavour. This will give you a beautiful mushroom stock that you will use in the risotto a bit later on. Warm 1 ½ tablespoons of oil in a large sautéing pan, chop the onion, and add this to the oil when hot. Sweat for a few minutes until the onions are soft and golden. Finely chop 2 cloves of garlic and add to the onion. Also now add the dried thyme. Check on the squash in the oven to make sure it is getting cooked but not burned. Add the rice to the onion and stir well. Give it a minute under constant stirring to soak up the flavour that’s already in the pan, before adding a ladle-full of stock. Keep stirring, as risotto will very easily stick to the bottom of the pan. Gradually add more and more stock, but let the rice soak up one portion before adding more. Add the porcini and its stock about half-way through the adding of the vegetable stock. Keep stirring and adding stock until the rice is cooked. It should be slightly al-dente, but moist and soft at the same time. You’ll know when you’re there.